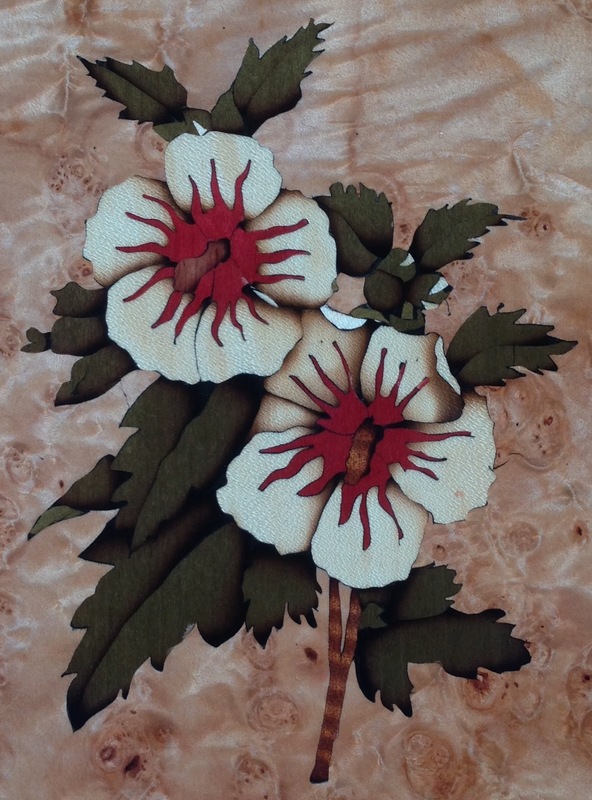 Not much to write about this, just a picture of the finished marquetry picture. After taking the finished part out of the press it’s pretty uninspiring. All of the work to date has been on the glue face. The marquetry was assembled face-down onto a kraft paper covered board. I actually made a mistake when assembling it and covered the paper face with hot hide glue, and nearly glued it upside down. I used plastic cauls to face this in the press, so it didn’t stick. So the clean up routine was to first sand it with 120 grit to remove the glue and then spray it with water and start scraping the paper off. Not my favorite job, you end up with a sticky mess. 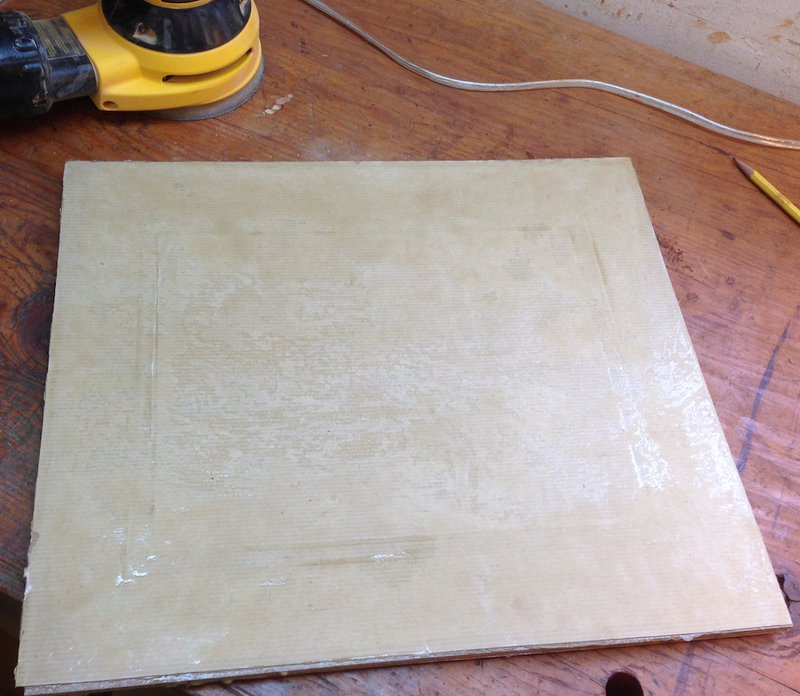 I was careful about how I applied water so it wouldn’t get under the veneer or soak into the MDF core. After the cleanup I gave it two coats of shellac, sanded with 180, then repeated the shellac and sanding with 220. At that point the surface was smooth and I shot it with two coats of lacquer. Fin. In the final grading, I’d give it a “B”. There are a couple of technical mistakes, and some compositional problems with shading and color, and there are some details of the sawing that I don’t like, where the contours are not right for the part. But it’s also the largest panel I’ve done, and the first time I’ve done a border like this. I’m going to set up another packet for a different design while I’m working on the Moxon vise and see where that goes. Then maybe, the Griffin. Maybe. Looks pretty damn good to me Joe! It has depth and movement. I like the details that show leaf and petal curl. Very nice. Shading is tricky thing to master and you have a good handle on it. Progress by leaps and bounds. Kind of gives me flashback sensations. Looks really good Joe. Have you considered cutting your own veneer, or have you already? I’ve considered it, but to get the variety and quantity (width) is more than I’m willing to do at the moment. If I get more of that .014″ stuff it’s going in the fireplace though. Looking very, very good. Bravo! You sure are getting the hang of this pretty fast. I am sure the next one will look even more awesome. Very, very well done, Joe! I’ll be very eager to see what you do next – Griffin or not. I haven’t been reading your blog long enough to evaluate your comment on the .014″ veneer. I presume that’s too thin – right? What is the ideal range of thickness? .023 is sort of standard for commercial veneer as best I can tell. I had some that was .035″ that felt substantial. The “French sawn” veneer at about .060″ (http://www.george-veneers.com/uk/index.htm) is the holy grail according to Patrick Edwards, who taught the class I attended last fall. The .015 range starts to feel too thin for me. As you can imagine, if the veneers vary much in thickness you have to somehow level them, mostly I’m trying to back fill them using the mastic mix. Sanding through the surface trying to flatten it sounds horrific. You started with inlay experiment in September 2014. You have literally been running on the marquetry learning curve. No doubt each following project will be even better. 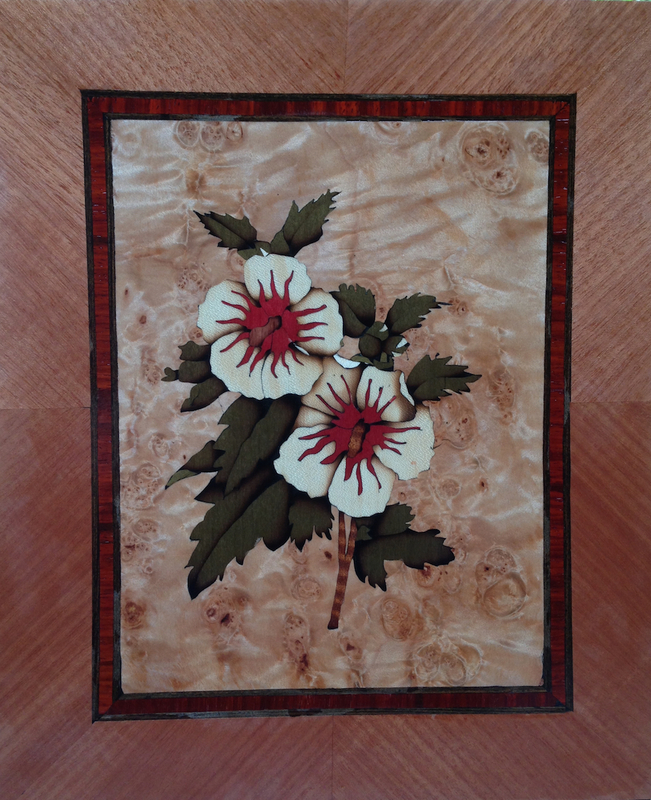 Will you stick with marquetry or would you, for some project, consider inlay again?